For over 200 years, Northern Virginia has enjoyed a respected reputation for its equestrian heritage. The present-day home of horse museums and libraries, as well as breeding, sports, and shows of all sort, Northern Virginia truly is "hunt country." 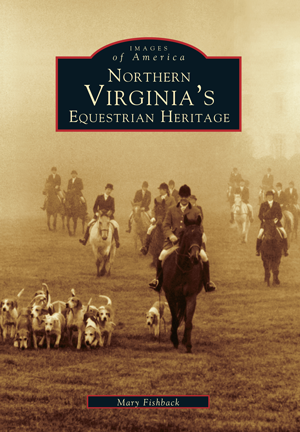 Northern Virginia's Equestrian Heritage showcases the area's early hunting history and offers a singular glimpse into the past glory days of fox hunts, hound-breeding, horse races, and horse shows. Beautiful estates where men and women gathered, partied, and hunted once dotted the landscape; today, however, many of these estates remain only in photographs and memories. The area's picturesque countryside has enticed well-known families, including the Kennedys and the DuPont Scotts, to join in the local favored pastime. Some of the world's best fox hunting took place in Loudoun County before the Civil War; afterwards, the hounds were let loose and very few quality packs remained. It took the combined help of fox hunters and land barons to reinstate the breeding of prestigious hounds and increase the sport's popularity once again. Upperville, the home of America's oldest horse show, dates to 1853 and has given shape to horse shows all over the country. Even women's place in equestrian history was rallied for in Northern Virginia; Viola Townsend Winmill, who became one of the "first ladies" of fox hunting, and her husband Robert C. Winmill lived in Warrenton for more than 50 years and played polo, raced horses, raised hounds, and collected coaches. Author Mary Fishback of the Thomas Balk Library presents her fourth volume of Northern Virginia's history in the Images of America series. She has culled many never-before-seen photographs from three local collections: The Museum of Hounds and Hunting at Morven Park, the Chronicle of the Horse magazine, and the National Sporting Library. Join her on a remarkable journey into Virginia's early days of equestrian sports.